Kimani reimagines the rise and fall of colonialism in Africa by telling the story of the birth of Kenya's railroad. Set in the shadow of Kenya's independence from Great Britain, Dance of the Jakaranda reimagines the rise and fall of colonialism, and the special circumstances that brought black, brown, and white men together to lay the railroad that heralded the birth of the nation. The novel traces the lives and loves of three men: preacher Richard Turnbull, the colonial administrator Ian McDonald, and Indian technician Babu Salim, whose lives intersect when they are implicated in the controversial birth of a child. Years later, when Babu's grandson, Rajan--who ekes out a living by singing Babu's epic tales of the railway's construction--accidentally kisses a mysterious stranger in a dark nightclub, the encounter provides the spark to illuminate the three men's shared, murky past. 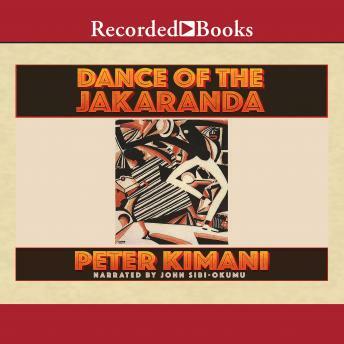 Dance of the Jakaranda could well be a story of globalization--not just for its riveting multi-racial, multi-cultural cast--but also due to its diverse literary allusions: from Chekhovian comedy to Kafkasque caricatures, or magical realism popularized by Gabriel Garcia Marquez. Yet, the novel is firmly anchored in the African storytelling tradition, its language a dreamy, exalted and earthy mix that creates new thresholds of identity, providing a fresh metaphor for race in contemporary Africa.